Suzan is a professor in the College of Education at Northwest University in Kirkland, WA, USA. She has experience teaching English in Japan and Mexico. Suzan has led teacher development workshops in Chile, Ecuador, the Dominican Republic, Costa Rica, China, and South Korea. 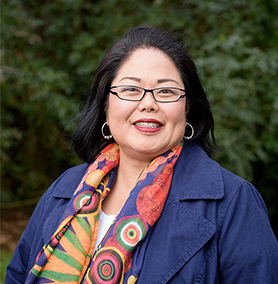 Her academic interests include language revitalization, literacy and identity, and culture and identity. Many Threads, One Tapestry: Classroom Learning and Cultural Identity The focus of this session is on cultural identity and the different cultures represented in our classrooms. We will work on interaction strategies that are positive and honoring of the complex identities that students and teachers hold. Participants will briefly look at concepts of cultural identity, community, and discourse, and implications for the classroom. The remainder of the session will be devoted to practicing cultural activities which help to uncover cultural values and beliefs, and to practicing activities which allow students to share their unique backgrounds in ways that strengthen classroom learning.